Air coolers, otherwise known as evaporative or swamp coolers, use the evaporation of water to cool an environment. When the air blows past water, some particles on the surface of the water are carried away. Those particles take some heat with them, cooling the air. That is how sweating works: The water particles on the surface of the skin carry off heat with them as they evaporate, cooling the skin. As a bonus, these air coolers use 75 percent less energy than central air conditioners, the Department of Energy reports. Using an air cooler could save you money. Evaporative coolers have different designs. In some, a fine mist is sprayed into the air and then propelled out with a fan. The water in this mist consists of fine droplets, causing the mist it to evaporate quickly, absorbing heat from the air. In other systems, air is actually blown past or through some material covered with water. It can be blown through a fine mesh, for example, or past wet pads. The evaporation cools the wet material, which in turn cools the air. 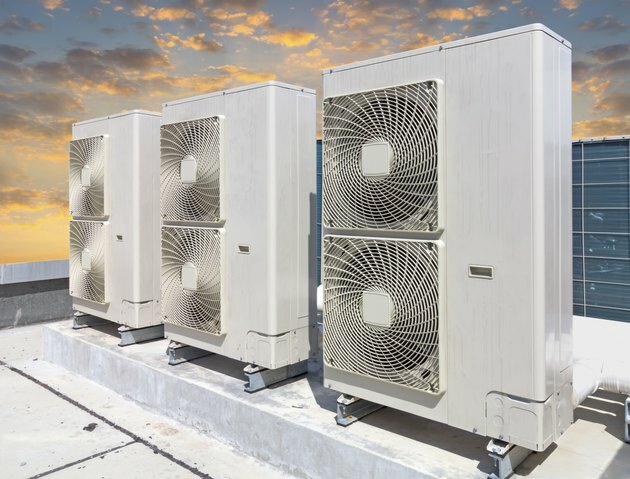 Traditional air conditioners work well in nearly any weather conditions, but evaporative cooling is more suited to some conditions than others. The air can hold only a certain amount of moisture, based largely on temperature. If it reaches that level, water starts to condense out of the air as fast as it evaporates into it, effectively preventing evaporative cooling. The relative humidity is a measure of the proportion of the maximum humidity the air can contain. For example, if the relative humidity is at 20 percent, the air contains 20 percent of its maximum humidity. On hot, dry days, the air can hold a lot more humidity than it contains, and evaporative cooling can decrease the temperature by as much as 30 degrees Fahrenheit. As it gets muggier, however, evaporative cooling becomes less effective. This cooling method works best in hot dry climates like Las Vegas, Nevada, and worst in hot, humid climates like New Orleans. What Are the Two Types of Fresh Water?